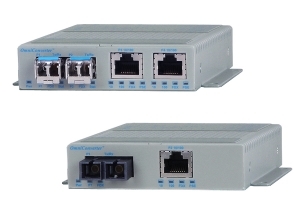 The OmniConverter FPoE/SL, FPoE/S and FPoE+/S are multi-port media converters that convert 10/100BASE-T copper to 100BASE-FX fiber and support Power-over-Ethernet (PoE and PoE+). Classified as Power Sourcing Equipment (PSE), they can provide power to one or two Powered Devices (PDs). The OmniConverter FPoE/SL, FPoE/S and FPoE+/S are multiport media converters that convert 10/100BASE-T copper to 100BASE-X fiber and support Power-over-Ethernet (PoE and PoE+). 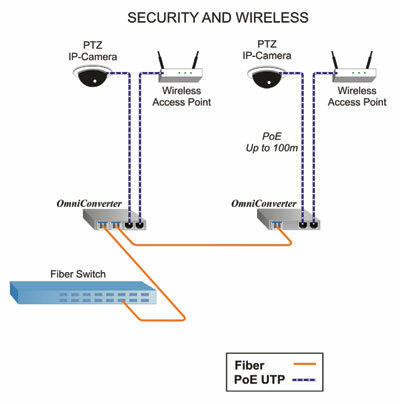 Classified as Power Sourcing Equipment (PSE), they provide power to one or two Powered Devices (PDs) using standard UTP cables that carry the Ethernet data. In this application example, PoE and PoE+ IP surveillance cameras and Wireless Access Points are installed throughout a large facility. A Network switch with fiber ports is used to distribute a fiber link from a control room to a OmniConverter media converter with dual fiber ports. The second fiber port on the OmniConverter is used to cascade the fiber to the next location, where an OmniConverter media converter with one fiber port terminates the fiber. In this application example, a fiber-to-the-desk network is deployed to leverage the security and distance benefits of fiber. In the main data closet, iConverter, miConverter or FlexPoint media converters can be installed in high-density rack-mount chassis to provide reliable and cost-effective fiber distribution from existing copper network equipment. 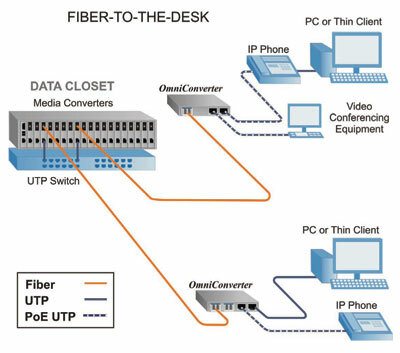 Fiber optic cables run to each office, where they are terminated by OmniConverter media converters. The OmniConverter media converters convert fiber to copper and, provide data and power to desktop devices such as IP phones and video conferencing equipment. They automatically disable PoE power to non-PoE desktop devices such as PCs and laptops. 2 A minimum of 52VDC is required to guarantee 25.5 watts at 100 meters on Cat 5 cable or better.